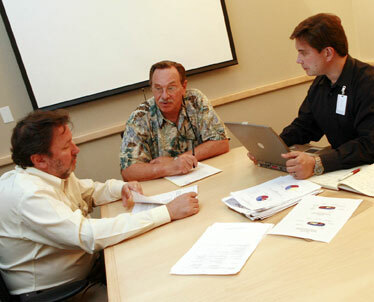 Meeting at UH in April were Michael Sage, Centers for Disease Control and Prevention project director, left, UH's Dr. Duane Gubler and CDC project senior adviser Harald Pietz. Dr. Duane J. Gubler, director of the University of Hawaii Asia-Pacific Institute of Tropical Medicine and Infectious Diseases, will lead a new partnership on infectious diseases in Singapore. Collaborators include Duke University, the National University of Singapore Graduate Medical School and UH's John A. Burns School of Medicine. Gubler has joined the Duke-National University of Singapore faculty but also will remain on Hawaii's medical school faculty. He has directed JABSOM's Asia-Pacific Institute for Tropical Medicine and Infectious Diseases since 2004 and chaired the Department of Tropical Medicine, Medical Microbiology and Pharmacology. He previously directed the U.S. Centers for Disease Control and Prevention's Division of Vector-Borne Infectious Diseases. He proposed several years ago to CDC Director Julie Gerberding that CDC work with Hawaii to be the center for infectious diseases in Asia and the Pacific, and he has been instrumental in forging a partnership. He also has obtained funding from the National Institutes of Health for a biocontainment laboratory at the medical school for research on emerging infectious diseases. Gubler, who has been in Washington, D.C., meeting with NIH and other officials, said in a telephone interview he will continue to work with Hawaii in the program he negotiated with Duke to start an emerging infectious-disease program in Singapore. The goal is to establish a world-class program that will be a regional reference center and help develop laboratory capacity for Southeast Asia, he said. "I think Hawaii will benefit from the Duke-Singapore partnership and leveraging resources." Patrick Casey, senior vice dean for research for the partnership, said in a news release it is hoped research from the program will help to "rapidly identify and prevent the spread of future SARS-like epidemics that may impact the global economy, and to develop new diagnostic tests, treatment and control strategies." Medical school interim Dean Gary Ostrander said, "We are excited about both the opportunity to retain Dr. Gubler at the John A. Burns School of Medicine and to partner with the prestigious Duke University in research so important to all of us." Gubler said UH has released four Asia-Pacific Institute faculty/research positions that were frozen two or three years ago. One will be used to hire a replacement for him as chairman of the Department of Tropical Medicine, Medical Microbiology and Pharmacology and director of the Pacific Regional Biosafety Laboratory, he said. He will remain institute director for an indefinite period, he said. He expects to live in Hawaii for another year, then move to Singapore, he said. Plans to build the biocontainment laboratory have been up and down, but after his recent meetings with NIH officials, Gubler said, "It's a go." The medical school has $37.5 million to build the laboratory -- $25 million from NIH and $12.5 million from the state -- and he said NIH will provide some supplemental funding. "It will allow us to build a larger building." Gubler said the CDC partnership "also is a go," with more meetings scheduled in Honolulu at the end of November. "They're hoping to have at least one person on the ground in Honolulu before the end of the year." CDC officials have said they want to build a collaboration in Hawaii that emphasizes early and rapid detection and response to emerging health threats, emergency preparedness and response to all hazards, and improves existing CDC-supported Hawaii programs.